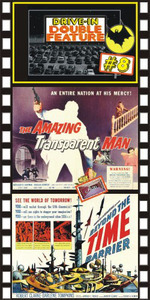 THE AMAZING TRANSPARENT MAN (1959) Douglas Kennedy, Marguerite Chapman, James Griffith. Terrific fun as an escaped bank robber is subjected to an atomic ray machine that renders him invisible. He breaks into military installations and banks, stealing radioactive materials and money. The film's climax features a struggle between Griffith and Kennedy in a lab where an atomic explosion is about to occur. Griffith screams in terror while Kennedy laughs hysterically and pins him to the floor. Vaporization is seconds away. Priceless. 16mm. Plus: BEYOND THE TIME BARRIER (1959) Robert Clarke, Darlene Tompkins, Arianne Arden, Vladimir Solokoff, directed By Edgar G. Ulmer. A jet pilot from the 20th century breaks through a time barrier in the sky to find himself on a post-World War III Earth, menaced by mutants and a deadly virus. 16mm.